Boardworks SHUBU Kraken SUP board has made an enormous impact on the paddleboarding industry. It is a revolutionary product. The inflatable feature scores above its peers. Hence; it has become pretty popular in a relatively short time. If you’re looking to buy a paddle board, it is better to go through our Boardworks SHUBU Kraken Paddle Board review below. Today, we will decipher the various features of the Boardworks iSUP SHUBU paddle board to help you understand why it is such a good option. Let us now look at some of the aspects of this paddle board which helps it stand out. The first feature which you will observe about this paddle board is the design. The aesthetics are much better as compared to any other inflatable paddle board out there. The combination of gray, blue and white color makes it stylish and aesthetically pleasing. In terms of aesthetics, there is hardly any other paddle board which comes close to it. 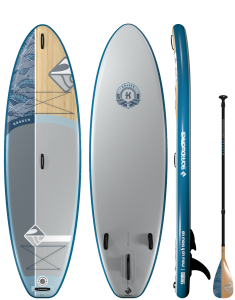 The Boardworks SUP SHUBU paddle board uses the dual fusion laminate structure. The main advantage of the dual-fusion laminate is that the high-density structure can handle a significant amount of weight. The internal fibers have a liquid PVC coating. The liquid PVC coating not only provides it with mechanical strength but also increases the oppression resistant. It means that even when you use the board day in and day out; there will be very little internal wear and tear. The weight of the liquid PVC coating is on the lower side which ensures that the strength of board enhances without adding its weight. The unique features of the board do not just end at the core. The top and the bottom surface consist of PVC tarpaulin. The tarpaulin resists any impact and reduces the wear and tear of the laminate structure. The sides include specialized material which further adds to the strength. Another advantage of the dual fusion laminate structure is that it uses very little toxic adhesives. In a way, it is more environment-friendly as compared to the other paddle boards. Thus, when you look at the core construction of this Boardworks paddle board; you will notice that it is much stronger as compared to the other options. Generally speaking, when buying paddle boards, paddle board above 4 inches thickness is more stable. The one which we are talking about now is 6 inches thick. Moreover, since the length is 10 feet, stability is not an issue at all. Any paddle board having a volume of over 200 L is highly stable. It is the perfect option for adults. The Boardworks inflatable paddle board which we are speaking about now has a volume of 253 L. Thus when you look at the actual performance or the technical specifications of the paddle board; it scores in all metrics when it comes to stability. It is the perfect option for individuals who want a stable and easy to use paddle board. The best thing about this paddle board is that it is inflatable. Hence, once deflated, you can carry it around quite easily. Since it comes along with a travel bag, you can directly inflate it near the beach. It will save you the discomfort of carrying a large paddle board to the beach. You can efficiently aerate it using the pump near the beach itself. Once deflated, it is pretty compact, and you can store the travel bag in the trunk of your car. It will not occupy a large amount of space. The inflatable nature makes it highly portable which is a definite advantage. The paddle board features three fins below it. There is the removable center fin while the side fins are non-removable. The design of the side and central fins is different. If you carefully observe, the water molecules have to travel a long distance when they go over the side fins. This design aims to ensure that while turning, it does not spin out of control. The side fins not only help it generate extra speed but makes sure that while turning, it does not spin. The center fin is responsible for stabilizing when moving in a straight line. The advantage of the Tri-fin design is that you will get proper stability not only when going in a straight line but also when you’re turning your board. If you want to travel at high speeds and do not mind an uneven ride, you can even remove the central fin which will allow you to get proper stability during turning, but when traveling in a straight line, you can attain higher speeds. Thus, the tri-fin structure ensures that you can customize the performance of the paddle board as per your requirement. If up until now, you have been wondering which pump you can use along with this paddle board, you don’t need to worry anymore. It comes along with the Bravo 4 pump. It is fully compatible with the paddle board. There is also a repair patch in-case, it suffers from any puncher or holes. The best thing about these accessories is that they can easily fit into the travel bag which comes along with it. You will not have to carry it separately. Owing to the inflatable design, it is highly portable. However, once inflated, it is easy to carry. It offers a couple of neoprene carrying handles. 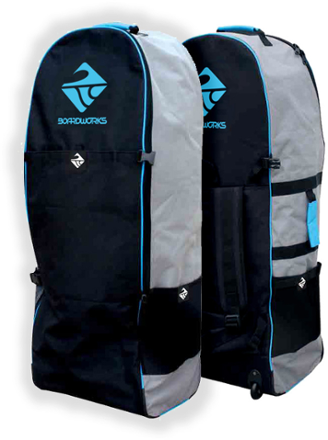 Neoprene handles are heavy-duty in nature which means that they can help you take the paddle board without any issues. Thus, it doesn’t matter whether this paddle board is inflated or deflated; you can move it around with ease. This board comes along with 2 D-rings. These are perfect for holding the pedals or the fishing rods. You can easily enjoy the hands-free experience when using this paddle board. It will help you relax rather than always having to hold the paddle in your hands. 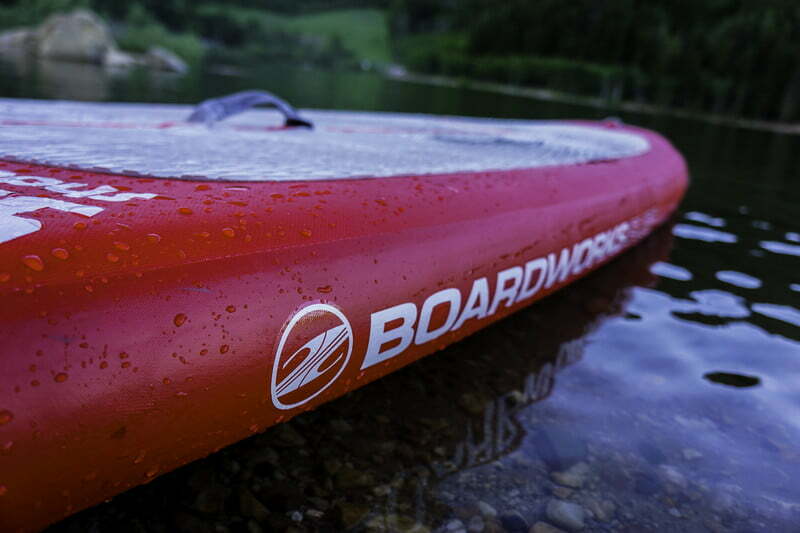 There is a bungee cord which allows you to carry the essential gear when using this paddle board. Not only it is portable, but can also help you carry essentials when you’re out in the water. The best thing about this paddle board is that the design is suitable for beginners as well as intermediate paddle boarders. The dimensions of 10’ x 34” x 6”, make it ideal for most of the adults. It has a weight carrying capacity of 250 lbs which makes it suitable for most of the adults. As you can see, most of the features which you might look for in a paddle board are present in this one. That is why; it is such a favorite Boardworks paddle board. So, if you’re searching for a paddle board which is not only easy to use but highly durable, you can consider this option. The unique set of features in this board makes it a perfect choice when you want to enjoy this new and upcoming sport. It is time to avoid those big paddle boards and use the one with which you can enjoy your paddleboarding. With superior construction and a variety of different features, the Boardworks SHUBU Kraken Stand Up Paddle Board gives you nothing to complain.